You can’t beat the pure bliss one experiences whilst sipping a rum cocktail amid ocean views. Fortunately, there are numerous bars and restaurants on Hawaii’s Big Island that serve up sunset views and umbrella-clad concoctions. 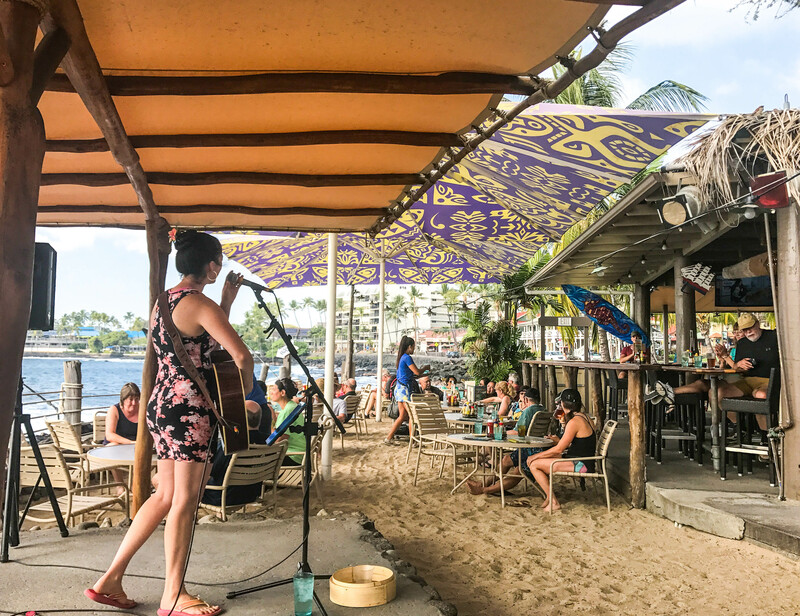 From waterfront watering holes to laid-back lounges, these are the best bars in Kona, Hawaii. Let your ears be your guide when attempting to locate this second-floor jazz bar. Though the signage is minimal and the entrance inconspicuous, a cacophony of instruments can be heard from the street, assuring you’ve found the place. Once you locate the entrance and ascend the piano key painted stairs, a good time is practically guaranteed. Inside the decor is sophisticated yet retro. Tables decorated with music notes and chairs with zebra print cushions cover nearly every inch of the dark wood floor, save for an opening near the stage on which tourists, emboldened by martinis, pair off and dance the two step, or swing, or waltz, or a combination of all (and sometimes none) of the above. On a recent Saturday evening, I arrived early enough to claim the concurred “best seat in the house” (a table against the railing with views of the ocean, stage and dance floor — all of which, in that order, put on a great show throughout the evening). 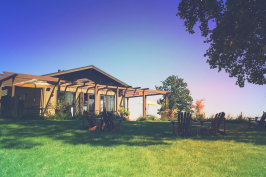 I sipped wine and snacked on an impressive charcuterie spread while taking in the beautiful sights and upbeat sounds that surrounded me. I literally love everything about this bar: the music, the food, the wine, the service — all spectacular. Before departing I visited the surprisingly large, single-person ladies room in which, hidden under a decorative bench, I noticed a pair of undies that had been discarded by a previous occupant(s?). Laughing as I left, I couldn’t help but think how someone else was, clearly, enjoying a much a better night than I. On The Rocks, If you couldn’t tell from my aforesaid love proclamation, is my favorite bar in Kona. 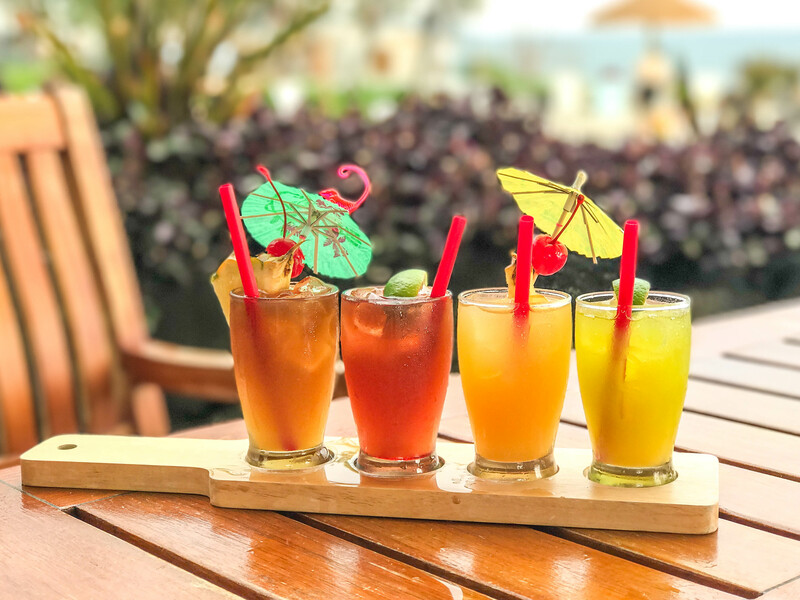 Everything about this establishment — from the quintessential tropical beach setting to the impressive menu and, of course, happy hour Mai Tais — works in perfect unison to provide patrons with a great overall dining and/or drinking experience. The toes-in-the sand restaurant area features casual dining options, while the covered tiki bar boasts a variety of tropical cocktails. A daily happy hour from 3-5pm offers $5 Mai Tais, $4 well drinks and wine, $2.50-$4 drafts, and $4 pupu specials (all of which are great). 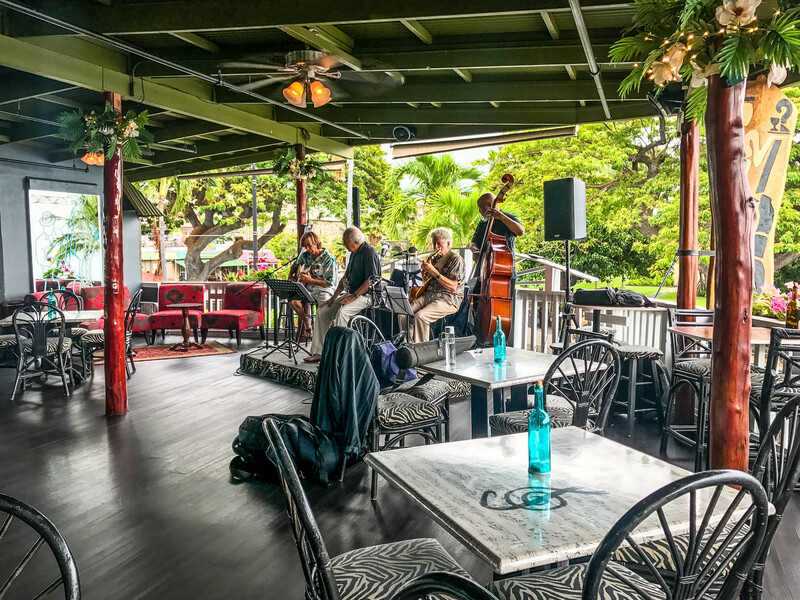 Every Friday, Saturday and Sunday local musicians serenade patrons with tropical tunes that further contribute to the quintessential aloha atmosphere. Although locals line the bar on a daily basis, Sundays here are a local staple. Every Sunday, island celebrity (and crazy-talented musician) LT Smooth takes the stage to serenade visitors with beautiful (seriously, beautiful) music. If you find yourself in Kona on a Sunday (or any day for that matter), I highly recommend stopping by. And if you see me posted up at the bar, sipping a Mai Tai, come say “Hi!”. The sister restaurant to On The Rocks, Huggo’s (the flagship restaurant) is located right next door. Though they share the same owner, the two establishments couldn’t be more different. Huggo’s restaurant-area features fine dining and a more upscale atmosphere, while the lounge-area (known as “hBar’) serves up creative cocktails and an impressive small plate menu that compliments the restaurant’s sea-to-table cuisine. Though the restaurant is great for a nice dinner, I generally prefer the lounge. Boasting beautiful views from almost every seat in the house (especially the outdoor patio and ocean-front couches) the lounge atmosphere is as good as (if not better than) the restaurant. On any given evening you’ll find a combination of tourists and locals sipping umbrella-clad cocktails amid a flamboyance of tiki torches whilst taking in stunning sunset views. One thing that Huggo’s and On The Rocks have in common is a killer happy hour. HBar opens at 4pm and happy hour runs from 4-6pm. However, the kitchen doesn’t open until 5pm so, if you want food from the happy hour menu (and trust me, you do), I recommend getting there between 5-6. Happy hour includes $5 mai tais and wines, as well as half off select menu items. Between the great food, stunning view and creative cocktails, Huggo’s Hbar is definitely worth a visit. A short walk south of Huggo’s sits Don’s Mai Tai Bar. 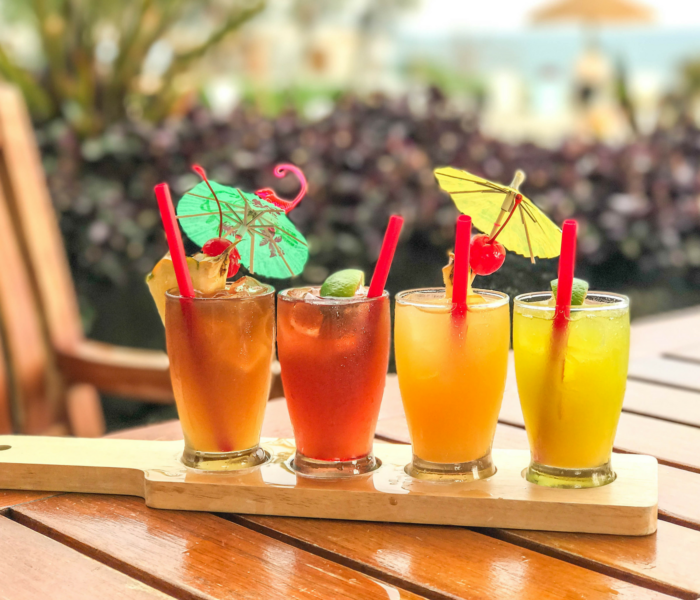 Located inside the Royal Kona Resort, Don’s Mai Tai Bar is the largest open-air, ocean-front bar in Kona (which makes it a spectacular place to watch the sunset). Touting itself as the inventor of the Mai Tai, Don’s cocktail menu sports a varied selection of this distinguished drink, including a Mai Tai flight for those wanting to taste four of the bar’s 10 different Mai Tais. If Mai Tais aren’t your thing you can also get a mojito flight or — for an in inordinate amount of brain freeze — a lava flow flight. Food here, though good enough, is besides the point. Come for the view, stay for the Mai Tais. Visit during happy hour (4-6pm) for half off Mai Tais and Pina Coladas, plus food specials. TIP: Don’s Mai Tai Bar is located right next to the Royal Kona’s famed Luau. Therefore, if you visit the bar on a Monday, Tuesday, Wednesday or Friday evening you’re able to watch the luau from the bar sans cover charge. 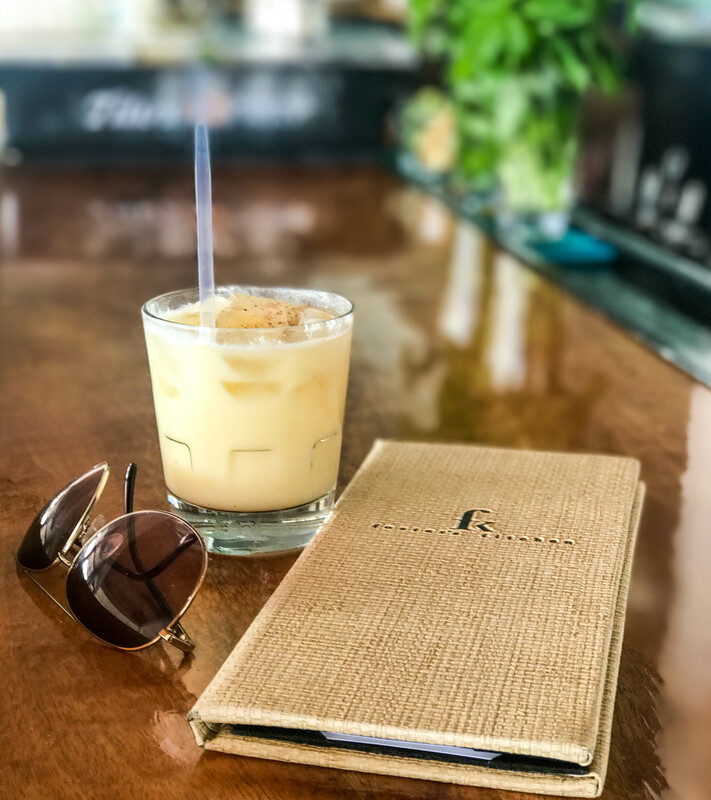 Located on the east side of Ali’i Drive, Foster’s Kitchen provides a warm welcome — and vast drink list — to anyone willing to summit the steep staircase and enter this popular yet understated establishment. The new restaurant and cocktail bar has made it a priority to celebrate fresh and local ingredients while serving made-from-scratch cuisine in an airy, laid-back atmosphere. Situated on the second floor, Foster’s Kitchen also boasts beautiful, unobstructed ocean views. Though a certain amount of bragging rights would be expected to accompany the scratch kitchen, craft cocktails and glowing Yelp reviews, at Foster’s Kitchen hospitality precedes any pretension. In a town where customer service is consistently underwhelming, Foster’s Kitchen is one of few places that’s raising the bar. Speaking of bar, let’s talk cocktails. Oh the cocktails. Such. Good. Cocktails! Complimenting the food menu, the hand-crafted cocktails combine fresh (and occasionally obscure) ingredients with indistinguishable syrups and liquors to create interesting and colorful concoctions that are a real treat for the palette. The Rosarito Margarita and the Stairway The Heaven are especially cool, complex and eminently drinkable. There are very few places in Kona where you can get a quality craft cocktail, and Foster’s Kitchen is definitely one of the top. Visit during happy hour (2-5pm & 9-10pm) for $2 off cocktails and appetizers plus $3 well drinks, wine and beer. Sometime’s smaller is better, or at least cozier. That’s why the aptly named Chill’n On The Bay is, in my opinion, the most “chill” bar in Kona. 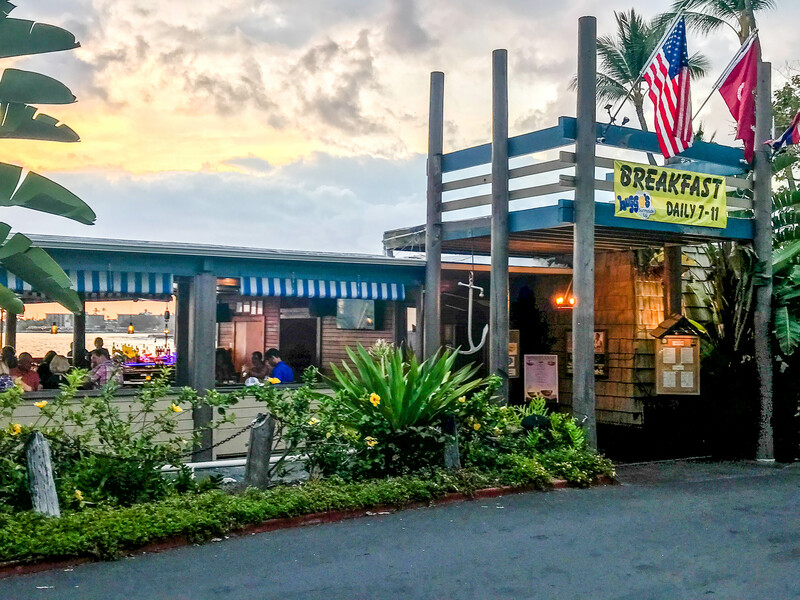 Located on the north end of Ali’i Dr. across from Kilua Bay, the bar maintains a cozily piratical mood while serving up beautiful bay views and mai tais in mason jars. Though the small bar may initially project a somewhat divey aura, I wouldn’t go so far as to call Chill’n a dive bar. It’s just a cool place to enjoy some good food and drinks in an intimate yet laid-back setting. Curiously, every time I visit I always have the same server. After visiting one night, then stopping in for a Bloody Mary the next morning (I swear I’m not an alcoholic), I asked the server — who had evidently closed then subsequently opened — if she had slept in the bar. She said no, admitting however that doing so would be cheaper, then proceeded to ask me the same question — touché. This old-friend style service is to be expected from the small bar, where staff is as quick to make you feel welcome as they are to refill your beverage. I’m told the food is good. However, I can only speak for the Pizza, which is so good I never order anything else (creature of habit). 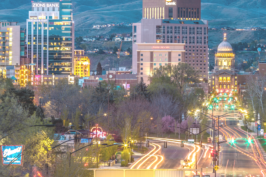 Additionally, several evenings a week Chill’n features live music by talented local musicians. 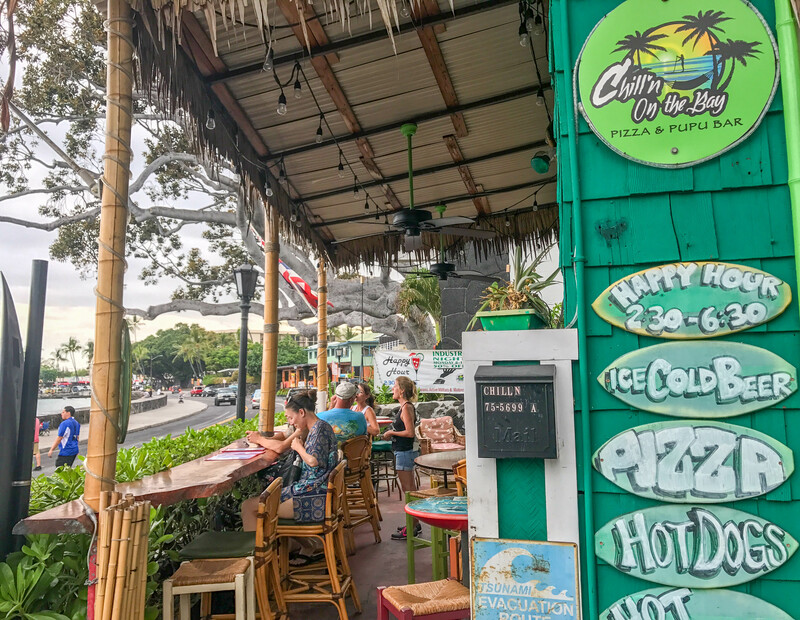 Between the splendiferous bay views, great live music, cold drinks, and delicious pizza, Chill’n is one of my favorite bars in Kona town. TIP: If there’s a swell moving through, this place provides endless entertainment. Grab a drink and watch as unsuspecting pedestrians (who blatantly ignore the yellow cones and wet ground) get surprised by the sneaky waves that occasionally crush over the seawall and drench anyone it its path. Being a cubs fan — or at least the baseball clueless counterpart to a die-hard one (which kind of makes me a fan by association, right?) — I love Lavern’s. Not only is Lavern’s a conveniently located Cubs bar, it’s an all-around great sports bar for anyone wanting to watch a game without sacrificing open-air ocean views. Inside the self-described “dive bar and sports oasis” every inch of wall space is covered with a variety of mementos + memorabilia, and there’s a presiding sense that what goes up on the walls never comes down. In addition to the flamboyant decor, Lavern’s boasts a nice beer selection and decent food menu. Visit during happy hour for boozy bargains on beer and Mai Tais. wow these all sound amazing, and your pictures are so wonderful..makes me miss Hawaii so bad, I haven’t been in two years! Take me to Hawaii!! These bars look amazing! If I ever get to visit here I will have to remember these! They look so beautiful. Well, that’s a different type of pub crawl to the ones I am used to. What wonderful views! I’d go for the first jazz bar I think though and stick. Love your bright colorful photos! 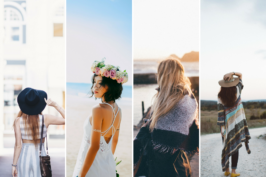 Someday I’ll make it to Hawaii…and check all these places out! I haven’t been to Hawaii yet, but would love to go! I bet the drinks taste even better with an ocean view! Great post. The pictures are amazing. I want to go to all of those places right now. I love the place where you might get splashed by a wave. All of these bars sound great! Definitely adding them to my travel board on Pinterest–we’re hoping to travel to Kona some time in 2019! Thank you for posting this about the great bats in Hawaii! We too, are creatures of habit. We stay in Kona so we tend to flock to the same places we know are good but this year, in nov-dec. we’re definitely going to have to venture out to the ones you mentioned! Thanks!!!! We are going in Dec. I will definitely use your list. Thank you.